During the weekend, Gov. Sarah Palin proceeded to “take the gloves off” for the McCain campaign by accusing Sen. Obama of “palling around” with terrorists who would destroy this country. Specifically, she said William Ayers was one of Sen. Obama’s earliest political supporters. She implied that Sen. Obama endorsed Ayers’ terrorist activities – an accusation that Sen. Obama flatly denies, and is frankly a patent falsehood. Sen. Barack Obama was eight years old when Ayers committed his foul acts. Gov. Sarah Palin cited a piece by the New York Times, a newspaper conservatives (including herself) disdain, drawing boo’s from the crowd at her speech. The NYT article, Joe Klein of Time magazine reports, “essentially says that Barack Obama and the former terrorist Bill Ayers have crossed paths in Chicago, served on a couple of charitable boards together, but aren’t particularly close. To Palin–or her scriptwriters–this means that Obama has been “palling around” with terrorists. The organization of which McCain was a board member had ties to the Contras, and other Latin American right-wing death squads. McCain was fully aware of this, and in the 1980’s tried to distance himself from the group after its activities were becoming well-known. The USCWF and WACL were some of the organizations Pres. Ronald Reagan used to bypass the will of Congress, and circumvent the law. McCain’s involvement in the U.S. Council for World Freedom, which extended from 1981 through, possibly, 1986 is significant — not merely because it ties him to unsavory characters but because it firmly associates him with a foreign policy that was, at the time and still, controversial. But McCain’s association with a group that reportedly circumvented law, financed right-wing military institutions, and engaged in sometimes brutal anti-communist tactics, could be telling for some voters. At the very least his time on the board of the U.S. Council of World Freedom provides a window of sorts into the foreign policy vision that he held back in the 1980s and one that he still seemingly holds today. “Remember this happened during a time when you were either with us or against us,” said Council on Foreign Relation’s O’Neil. “Somewhat like the mindset,” that we have seen with the Bush administration (Huffington Post). This recently-surfaced information is receiving quite a stir from independents and Democrats, even in Washington. So now, McCain not only has the Keating Five scandal, but also the USCWF board membership to answer for – all thanks to a nasty swift-boat-style smear tactic. It looks like Gov. Palin should have thought this over a little more. This entire incident is a further sign of the McCain campaign’s deterioration and desperation – partly exasperated by the financial crisis. 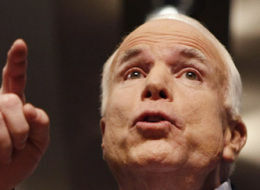 McCain’s play-book seems to read that if he has an inconvenient record on the issues such as the economy and deregulation, then he will resort to hateful, distracting, and dishonorable attacks. ~ by jsacc001 on October 8, 2008.